Patch-clamp recordings and simultaneous intracellular biocytin filling of synaptically coupled neurons in acute brain slices allow a correlated analysis of their structural and functional properties. The aim of this protocol is to describe the essential technical steps of electrophysiological recording from neuronal microcircuits and their subsequent morphological analysis. Qi, G., Radnikow, G., Feldmeyer, D. Electrophysiological and Morphological Characterization of Neuronal Microcircuits in Acute Brain Slices Using Paired Patch-Clamp Recordings. J. Vis. Exp. (95), e52358, doi:10.3791/52358 (2015). The combination of patch clamp recordings from two (or more) synaptically coupled neurons (paired recordings) in acute brain slice preparations with simultaneous intracellular biocytin filling allows a correlated analysis of their structural and functional properties. With this method it is possible to identify and characterize both pre- and postsynaptic neurons by their morphology and electrophysiological response pattern. Paired recordings allow studying the connectivity patterns between these neurons as well as the properties of both chemical and electrical synaptic transmission. Here, we give a step-by-step description of the procedures required to obtain reliable paired recordings together with an optimal recovery of the neuron morphology. We will describe how pairs of neurons connected via chemical synapses or gap junctions are identified in brain slice preparations. We will outline how neurons are reconstructed to obtain their 3D morphology of the dendritic and axonal domain and how synaptic contacts are identified and localized. We will also discuss the caveats and limitations of the paired recording technique, in particular those associated with dendritic and axonal truncations during the preparation of brain slices because these strongly affect connectivity estimates. However, because of the versatility of the paired recording approach it will remain a valuable tool in characterizing different aspects of synaptic transmission at identified neuronal microcircuits in the brain. Neuronal microcircuits between two synaptically coupled neurons are the building blocks of large-scale networks in the brain and are the fundamental units of synaptic information processing. A prerequisite for the characterization of such neuronal microcircuits is to know the morphology and functional properties of both the pre- and postsynaptic partner neurons, the type of the synaptic connection(s) and its structure and functional mechanism. However, in many studies of synaptic connections at least one of the neurons in a microcircuit is not well characterized. This results from the relatively unspecific stimulation protocols often used in studies of synaptic connectivity. Therefore, the structural and functional properties of the presynaptic neuron are either not identified at all or only to a rather small extent (i.e., the expression of marker proteins etc.). Paired recordings in combination with intracellular staining by markers such as biocytin, neurobiotin or fluorescent dyes are better suited for studying small neuronal microcircuits. This technique allows one to investigate many structural and functional parameters of a morphologically identified synaptic connection at the same time. So-called ‘unitary’ monosynaptic connections between two neurons have been investigated in both cortical and subcortical brain regions1-10 using acute slice preparations. Initially, sharp microelectrodes were used in these experiments; later, patch clamp recording was employed in order to obtain recordings of synaptic signals with a lower noise level and an improved temporal resolution. A significant technical advance was the use of infrared differential interference contrast (IR-DIC) optics11-14, a microscopic technique that significantly improved the visibility and identification of neurons in the brain slice so that it became possible to obtain recordings from visually identified synaptic connections15-17. In general, paired recordings are done in acute slice preparations; only very few publications are available reporting recordings from synaptically connected neurons in vivo18-20. The most important advantage of paired recordings is the fact that a functional characterization can be combined with a morphological analysis at both the light and electron microscopic level (see e.g.,7,16,21). After histochemical processing, the dendritic and axonal morphology of the synaptically connected neuron pair is traced. Subsequently, it is possible to quantify morphological features such as length, spatial density, orientation, branching pattern etc. These parameters may then provide a basis for an objective classification of a specific synaptic connection. Furthermore, in contrast to most other techniques used for studying neuronal connectivity, paired recordings also permit the identification of synaptic contacts for unitary synaptic connections. This can be done directly using a combination of light and electron microscopy16,21-27 or using calcium imaging28,29 of dendritic spines. However, with the latter approach only excitatory but not inhibitory connections can be studied as it requires calcium influx via the postsynaptic receptor channels. In addition to a detailed analysis of synaptic transmission at a defined neuronal microcircuit paired recordings also allow the study of synaptic plasticity rules30,31 or – in combination with agonist/antagonist application – the modulation of synaptic transmission by neurotransmitters such as acetylcholine32 and adenosine33. All experimental procedures have been carried out in accordance with the EU Directive for the Protection of Animals, the German Animal Welfare Act (Tierschutzgesetz) and the Guidelines of the Federation of European Laboratory Animal Science Association. Install an anti-vibration table on which the microscope, the manipulators and all other equipment will be placed. NOTE: Vibration or any other kind of movement needs to be as small as possible when recording from synaptic connections because this requires a change of pipettes (searching electrode replaced by recording electrode). Place a Faraday cage around the anti-vibration table to reduce electrical noise. Connect all equipment inside the Faraday cage with the electrical ground. Install a microscope with a motorized focus axis that is based on a motorized x-y table on the anti-vibration table according to the manufacturer’s guidelines. This allows to reliably move the microscope to neurons that are not in the same field of view as it is the case for translaminar connections in the neocortex. Install a video camera on the camera port of the microscope and connect it to analog and/or digital screens to observe the slice preparation and the movement of electrodes. Use a camera, which can be switched between a low- and a high-power magnification to obtain an overview and a close-up image, respectively, of the synaptically coupled neuronal cell pair. This also helps to control the movement of the patch electrodes. Install a specimen table containing an inset for the bath chamber (drilled in-house from a Perspex block) for the brain slice preparation. This specimen table must not be connected to the microscope, i.e., must be fixed to the air table and the microscope should be maneuverable under it. Mount two (or more if required) high-precision micromanipulators that can be moved in all three dimensions. Install patch-clamp pre-amplifier on the manipulators and connect them to the main amplifier. NOTE: If required additional manipulators can be installed for e.g., more than two pre-amplifiers, extracellular stimulation electrodes, drug-delivery systems, etc. Place the bath chamber in the specimen table. Install a solution inlet and outlet and connect them to the perfusion system. Use a peristaltic pump to maintain the perfusion of the recording chamber with artificial cerebrospinal fluid (ACSF; Table 1) at a stable flow rate of 4 - 6 ml/min for optimal slice viability. NOTE: Do not exceed this flow rate significantly as it will result in turbulence in the ASCF and hence movement of the slice. Install holders for the temperature probe and Ag/AgCl ground electrode onto the specimen table. This is necessary to allow the probe and electrode to sample the bath in the chamber. For a good visibility of neurons in the slice preparation use infrared illumination in the microscope. This reduces light diffraction and hence image blur. Ensure that the microscope is equipped with differential interference contrast optics to achieve a ‘3D’-like visualization. This will help patching neurons and allow targeting neurons deep in the slice (60 µm or deeper). During the experiment, keep brain slices in an experimental chamber with a glass coverslip at the bottom. Place a ‘platinum harp’ on the top of slice to prevent slices from floating. A platinum harp is made from U-shaped, flattened platinum wire with strings of dental floss glued onto it. Keep the ACSF perfusing the slice at a temperature of 32 - 35 °C to ensure optimal control of oxygenation and pH. This can be done by heating the solution with a Peltier device installed close to the ACSF inflow into the bath chamber. NOTE: Use ultrathin cover slips so that even microscope condensers with a high numerical aperture and short working distance can be focused on the specimen. This is necessary for an optimal illumination of the slice. For an image and a description of an electrophysiology set-up optimized for paired recordings in the brain slice preparation see Figure 4 in Ref. 34. Mildly anesthetize the animal from which the brain tissue should be taken with isoflurane (final concentration <0.1%). NOTE: Other anesthetics can also be used. Use of the anesthetic should comply with the respective animal committee’s recommendations and rules. Always ensure that the animal is not irritated or under stress after adding the anesthetic. Decapitate the animal, open the skull and remove the brain as quickly as possible using the procedure described in Refs. 34,35. Transfer the brain into cooled (4 °C) artificial cerebrospinal fluid aerated with a mixture of carbogen gas with 95% O2 and 5% CO2. Isolate the brain region that should be studied. NOTE: The parameters to obtain optimal preservation and minimal truncation of dendrites and axons of pre- and postsynaptic neurons should be determined in advance for each neuronal connection and developmental stage under investigation. In an optimally dissected brain slice, the axon of the presynaptic neuron is not required to be parallel to the slice surface. Rather, they should point into the slices with a shallow angle. The applies for the apical dendrite of postsynaptic pyramidal neurons; this should be checked under the light microscope. This is particularly important for non-local or translaminar synaptic connections, i.e., where pre- and postsynaptic somata are more than 200 µm apart and the probability of dendritic and axonal truncations is likely to be substantially higher than for local connections. Transfer the brain to the microtome chamber. Based on empirical findings, different extracellular slicing solutions are used depending on the age of the animal (see Tables 2 and 3; helpful information can also be found under ‘http://www.brainslicemethods.com/’). Trim the brain until the target region is visible. To obtain slices with a good cell visibility, cut 300 - 400 µm thick brain slices if the animal is mature (>3 weeks). If the animal is immature (1st to 2nd postnatal week for mice and rats) slices may be cut up to a thickness of ~600 - 800 µm without substantially impairing cell visibility. NOTE: This will improve the stability of ‘immature’ slices and reduce the number of possible truncations of long-range dendritic and axonal collaterals. Transfer slices from the microtome chamber to an incubation chamber filled with slicing solution aerated with a mixture of 95% O2 and 5% CO2. Keep the slices in the incubation chamber for at least 30 min to 1 hr either at RT or at ~30 °C, depending on the type of experiment. Fill the patch pipettes with an internal solution of the composition listed in Table 4. For all recordings in the whole-cell configuration add biocytin at concentrations between 3 - 5 mg/ml to the internal (pipette) solution to obtain good staining results for the pre- and postsynaptic neurons. Let biocytin diffuse into the cell for at least 15 - 30 min (depending on the size of the neuron). NOTE: Do not add biocytin to the solution used in the ‘searching’ pipettes mentioned below. Patch a putative postsynaptic neuron in the whole-cell mode. Use patch pipettes with a long and slender shank. This facilitates the maneuverability of the pipette under the objective and reduces movement artifacts that may occur when the electrode is introduced in the slice. Then, patch a potential presynaptic neuron in a cell-attached configuration using a ‘searching’ patch pipette of 8 - 10 MΩ resistance and a small tip diameter. With these pipettes establish a ‘loose’ cell-attached patch. Fill the ‘searching’ pipette with an internal solution in which K+ is replaced by Na+ (Table 5) in order not to depolarize neurons during searching for a presynaptic cell. NOTE: The ‘loose’ seal resistance is not in the GΩ range but typically around 30 - 300 MΩ. Hold the membrane potential under the ‘loose’ seal to about -30 to -60 mV in current clamp mode. Then, apply large current pulses (0.2 - 2 nA) to elicit an action potential in the potential presynaptic cell. Observe this action potential as a small spikelet on the voltage response. Set the stimulation frequency to 0.1 Hz to prevent run-down of a postsynaptic response. Use lower stimulation frequencies in case the brain tissue is very immature or the synaptic connection not very reliable. In case the ‘postsynaptic’ neuron does not respond to stimulation of the tested ‘presynaptic’ neuron, patch a new neuron in ‘loose’ seal mode. Do not replace the ‘searching’ patch electrode as long as the seal with a resistance of >30 MΩ is established. Test up to 30 potentially presynaptic neurons in this way. NOTE: To prevent damaging the neuron during the searching procedure with loose patch clamp, only gently suction should be applied to the searching pipette compared with that applied to the whole-cell patch pipette. If stimulation in the ‘loose’ seal mode results in an EPSP/IPSP with a latency <5 msec in the postsynaptic neuron remove the ‘searching’ pipette from the presynaptic neuron. Replace the ‘searching’ patch pipette with a patch electrode filled with biocytin-containing, regular internal solution. Ensure this recording patch pipette has a resistance of 4 - 8 MΩ; the larger the soma size the lower the electrode resistance can be. Patch the presynaptic neuron and record in whole-cell, current-clamp mode. Elicit action potentials by current injection in the presynaptic neurons and record the postsynaptic response. Store the data on a computer for later off-line analysis. NOTE: For neuronal microcircuits with a high connectivity ratio (> 30%) use a different procedure to find synaptic connections. This procedure is outlined below and is often used for inhibitory synaptic connection that have on average a higher connectivity ratio than excitatory connections36. It should not be used when the connectivity ratio falls below this value. Patch a presynaptic neuron directly in the whole-cell mode. Then, patch a potential postsynaptic neuron, also in whole cell mode. Both cells should be under current clamp control. Elicit an action potential in the presynaptic cell. Monitor the prospective postsynaptic neuron for a postsynaptic potential. In case the neuron does not show a response to presynaptic stimulation, patch a new neuron in whole-cell mode using a patch electrode filled with regular internal solution. If a connection is found, do not change the patch pipette but proceed with recording. Then, proceed as in step 3.1.9. NOTE: To search for electrical (gap-junction) connections use the following procedure which is a modified version of that used for low-probability connections. Patch a postsynaptic neuron in the whole-cell patch clamp configuration. Subsequently, patch a putative presynaptic neuron in the loose-seal configuration (low seal resistance of 30 - 300 MΩ) using a ‘searching’ patch pipette of 7 - 10 MΩ resistance. This pipette should be filled with the modified high Na+ internal solution for loose-seal stimulation. Inject 100 - 300 msec long hyperpolarizing current pulses via the ‘loose’ seal; the pipette command potential should be set to about -60 to -70 mV. Observe a gap junction connection if this stimulation results in a small hyperpolarizing response in the ‘postsynaptic’ neuron. Repatch the ‘presynaptic’ neuron in the whole-cell mode and proceed as described above. NOTE: To ensure a good staining of the axonal and dendritic processes, use the protocol given below. This protocol is described in brief here, however, a detailed protocol for histochemical processing used in our laboratory is given in Ref. 37. Transfer the brain slice with the pair of synaptically coupled neurons into a vial containing 4% paraformaldehyde dissolved in 0.1 M phosphate buffer and fixate the slice for 24 hr. For electron microscopy, fixate the slice using 2.5% glutaraldehyde and 1% paraformaldehyde. On the next day, transfer the slices into normal phosphate buffer containing no fixative. Wash slices with phosphate buffer for 6 - 8 times for 10 - 15 min each to remove excess fixative. Incubate slices for 20 min in a 3% H2O2 solution in 0.1 M phosphate buffer to minimize the endogenous peroxidase reaction. Observe strong bubble formation. Continue the reaction until no further bubbles are produced. Then, rinse the slices in 0.1 M phosphate buffer for 6 - 8 times (for 10 min each) to remove any remaining H2O2. Prepare the ABC solution as per the manufacture’s protocol. Add to 14.55 ml phosphate buffer supplemented with 150 µl 10% Triton X100 (Table 6; only for light microscopy) and keep the solution for about 30 min in the dark. Incubate slices in this solution O/N before use. Incubate slices in ABC solution on a shaker for 1 hr at RT and in the dark. Subsequently, keep slices O/N at 4 °C in a fridge. On the next morning, incubate slices at RT for an additional hour. After this, rinse slices at least four times for 10 min each in phosphate buffer. Then, incubate on a shaker for about 30 min in the dark in 2 ml of a nickel-intensified 3-3’-diaminobenzidine solution (Table 7). Be very careful when handling diaminobenzidine and use only under the fume hood; it is extremely carcinogenic even at very low concentrations. Add 6.5 µl 3% H2O2 to the diaminobenzidine-containing solution. Monitor the chromogenic reaction under a light microscope until brown-black stained neurons are clearly visible. Then, stop the reaction immediately by washing slices several times in phosphate buffer. Mount slices with stained neurons on adhesive, silane-coated Histobond or gelatinized standard object slides. Keep the slides in a moist chamber with at least 80% humidity O/N. On the next day, let the slices air-dry for a further 10 min. Prior to embedding, transfer slides in solutions with increasing concentrations of ethanol (20 - 100%) in order to dehydrate them. NOTE: The dehydration process should be slow otherwise distortions in the dendritic and axonal processes are likely to occur37. If an alternative embedding procedure is chosen, e.g., one with the glycerol-based Moviol, a dehydration is not required; however this is likely to result in an inhomogeneous compression of the slice and hence a distorted neuronal morphology. Finally, incubate for 10 min in xylol, embed the slices in a hydrophobic embedding medium for light microscopy and place an ultra-thin coverslips on top. Let slides dry for 20 min at RT. Examine slides with biocytin-labeled neurons under a light microscope equipped with a 60X/100X oil immersion objective and a condenser with a high numerical aperture for optimal spatial resolution. Ensure that axonal boutons and dendritic spines are clearly visible. Trace neurons or synaptically coupled neuron pairs using a commercial neuron tracing system (see Table of Specific Materials/Equipment) to obtain 3D neuronal reconstructions. Carry out tracing manually under constant visual inspection to detect even small axonal or dendritic collaterals. For paired recordings from synaptically coupled neurons manual tracing is still the method of choice because the attribution of e.g., an axonal profile to either the pre- or postsynaptic neuron requires substantial reconstruction experience. If required, make counts of axonal boutons and/or dendritic spines. Because spines or even spine subtypes and axonal boutons may exhibit a specific distribution and density with respect to e.g., cortical layer or area, this could help to characterize neuronal cell types. For synaptically coupled neuron pairs, check the presynaptic axon and postsynaptic dendrites for close appositions at the highest magnification available. Observe an axonal bouton and a postsynaptic dendritic spine or shaft is in the same focal plane can be considered as a putative synaptic contact. Mark this contact in the reconstruction. Correct the neuronal reconstructions for shrinkage in all three spatial dimensions in the appropriate section of the tracing program. NOTE: During fixation, histochemical processing and dehydration substantial mechanical deformation and shrinkage occur; this will affect axonal and dendritic length measurements and severely distort their spatial arrangement. Shrinkage correction factors for the embedding medium are ~1.1 for x and y directions and ~2.1 for the z-direction37. For a quantitative morphological analysis use a data analysis program for neurophysiology (see Table of Specific Materials/Equipment). Paired recordings are the method of choice for an in-depth characterization of morphologically identified uni- or bidirectional synaptic connections as well as gap junction (electrical) connections (Figure 1). An example of a paired recording in layer 4 of the somatosensory barrel cortex is shown in Figure 1A. Both unidirectional excitatory and inhibitory synaptic connections can be characterized (Figure 1B,C). Furthermore paired recordings allow to record from bidirectional synaptic connections, i.e., from connections in which both neurons in a pair are pre- and postsynaptic to one another. This is illustrated in Figure 1D, which shows recordings from an inhibitory interneuron and an excitatory neuron. Eliciting an action potential in the excitatory neuron (red traces) results in an EPSP in the postsynaptic inhibitory interneuron (black traces). However, when an action potential is evoked in the interneuron, an IPSP can be recorded in the excitatory neuron. Figure 1E shows that it is also feasible to record from neurons coupled via gap junction or via a gap junction and a chemical synapse. Reciprocal and gap junction connections can only be identified by paired electrophysiological recordings so far but not by any other technique. The combination of biocytin filling of coupled neurons via the patch pipette and the electrophysiological recordings allows a correlation of morphological properties of the neurons to synaptic properties. After histochemical processing neurons are visible as dark structures in the fixated slice (Figure 2A). Thereafter the recorded neuronal cell pair can be reconstructed morphologically and the neuronal cell types can be identified. Moreover, it is possible to identify the number and location of putative synaptic contacts (Figure 2A right panels and Figure 2B inset). The neuron pair shown in Figure 2B is reciprocally connected and hence synaptic contacts are established on both neurons. In our hands, putative, light microscopically identified synaptic contacts were confirmed as true synaptic contacts with the electron microscope with a 80 - 90% degree of accuracy16,21,26. Figure 3 shows an example of a paired recording from a presynaptic pyramidal neuron in neocortical layer 6 of the barrel cortex and an excitatory spiny neuron in layer 4. This translaminar neuronal microcircuit has a low connection probability but can be identified using the searching procedure described in steps 3.1.1 - 3.1.9 for neuronal connections with a low connectivity. With the paired recording technique it is possible to identify synaptic connections with a very low connectivity as is the case of some long-range translaminar connections (this example) or connections between neurons located in different cortical ‘columns’ (inter-columnar synaptic connections). Figure 1. Paired recordings from synaptically coupled cell pairs. (A) Left, IR-DIC image of a brain slice. Right, an interneuron (top) and an excitatory neuron (bottom). (B) A presynaptic action potential (top) in an excitatory neuron elicits a monosynaptic excitatory postsynaptic potential (EPSP) in another excitatory neuron (bottom). (C) An action potential (top) in a presynaptic inhibitory interneuron evokes a monosynaptic inhibitory postsynaptic potential (IPSP) in an excitatory neuron (bottom). (D) An action potential (top left) in a presynaptic excitatory neuron evokes an EPSP (bottom left) in an inhibitory interneuron. In turn, an action potential in the inhibitory interneuron (top right) elicits an IPSP in the excitatory neuron (bottom right). (E) A series of hyper- and depolarizing voltage steps elicited by current injections into a neuron (top left) is reflected in a gap-junction coupled second neuron (bottom left). In addition, a presynaptic action potential (top right) in the first neuron evokes an early small depolarization (spikelet, inset) followed by a late deep hyperpolarization (IPSP) in the membrane potential of the second neuron (bottom right). Scale bars in (B) apply also to (C). Please click here to view a larger version of this figure. Figure 2. Identification of synaptic contacts and morphological reconstruction of biocytin-filled cell pairs. (A) Left, low-power photomicrograph of a reciprocally coupled cell pair comprising a spiny stellate and a fast-spiking interneuron in layer 4 that were filled with biocytin during recording. Light microscopically identified putative excitatory synaptic contacts between the presynaptic spiny neuron and the postsynaptic interneuron are marked by green dots. Putative reciprocal inhibitory synaptic contacts are indicated by blue dots. Right, high-power images of synaptic contacts. Green open circles, excitatory contacts; blue open circles, inhibitory contacts. Layer borders were determined by the cytoarchitectonic structure of the stained brain slice under the low power microscope. (B) Neurolucida reconstruction of the same cell pair shown in (A) and Figure 1C. Blue, interneuron axon; red, interneuron soma and dendrite; green, spiny neuron axon; white, spiny neuron soma and dendrite. The inset shows the somatodendritic compartments of the pre- and postsynaptic neurons together with the putative synaptic contacts. Barrel contours were identified in the low power bright-field photomicrographs made from the acute brain slice. Please click here to view a larger version of this figure. Figure 3. A representative synaptic connection with very low connectivity ratio. (A) A presynaptic action potential (top) in a layer 6 pyramidal cell evokes a monosynaptic excitatory postsynaptic potential (bottom) in a layer 4 star pyramidal neuron. Notice the long latency (>3.0 msec) of this trans-laminar connection compared to that of local intra-laminar connections (≈1.0 msec). (B) Postsynaptic response of layer 4 star pyramidal neuron to two action potentials at 10 Hz elicited in a layer 6 pyramidal cells. Note the short-term facilitation of this connection compared to the short-term depression of local connections (data not shown). (C) Extended depth of focus imaging of the same connection as in (A,B). Inset, the somato/dendritic domain of a layer 4 star pyramidal neuron. Note the presence of a prominent apical dendrite marked by an arrow. Please click here to view a larger version of this figure. Table 1. Artificial cerebrospinal fluid (ACSF) for perfusion during recording. Table 2. Extracellular solution for acute brain slices of immature animals. Table 3. Extracellular solution for acute brain slices of mature animals (sucrose saline). Table 4. Low chloride pipette solution. Table 5. High Na pipette solution for searching synaptically coupled neurons. Table 6. ABC solution for histochemical reaction. 1% (NH4)2Ni(SO4)2 and 1% CoCl2 are added drop by drop while stirring the solution. Table 7. Solution for diaminobenzidine (DAB) reaction. Paired recordings from synaptically coupled excitatory and/or inhibitory neurons are a very versatile approach for the study of neuronal microcircuits. Not only does this approach allow one to estimate synaptic connectivity between neuron types but also allows determining the functional characteristics of the connection and the morphology of pre- and postsynaptic neurons. Furthermore, agonist and/or antagonist can easily be applied to neurons in slice preparations. This allows one to study the effects of neuromodulators on the properties of synaptic transmission32 or an in-depth characterization of a defined unitary synaptic connection using, for example, quantal analysis of synaptic release16,17,38,39. Finding of chemical and/or electrical (gap junction) synaptic connections is the most critical step of this protocol. We have therefore listed different approaches for finding synaptic connections, depending on the connectivity ratio and its type (chemical/electrical). A major disadvantage of slice preparations is the often substantial truncation of long-range axonal projections so that only small parts of the total axonal length of the axon are recovered. For some pyramidal cell types, the degree of truncation could up to 90% or even more when taking projections to other cortical areas or subcortical regions into account. This renders the slice preparation unsuitable for the study of synaptic connections between neurons the cell bodies of which are more than >300 µm apart. However, in acute slice preparations, local axonal projections, in particular those of local interneurons are generally recovered with a relatively low degree of dendritic and axonal truncation (~10% or less) because of the limited horizontal and vertically field span of their axonal arbors. Connections involving these types of neurons can therefore be characterized with a high degree of accuracy and reliability and yield largely correct connectivity estimates. With the exception of these local synaptic connections, absolute values for connectivity ratios between two neuron types obtained in slice preparations are highly problematic, in particular for neurons with large inter-somatic distances as in translaminar or non-local, long-range intralaminar synaptic connections. This problem is exacerbated when slicing conditions have not been optimized for a given synaptic connection at a defined age. For more realistic connectivity estimated novel methodologies such as dense electron microscopic reconstructions40 and structural axo-dendritic overlap41 have been developed. However, even these techniques have to take into account the high diversity of inhibitory interneurons and also excitatory neurons. An additional problem with connectivity estimates is that distal synaptic contacts, e.g., those on apical tuft of pyramidal neurons, may escape detection. When measured at the soma the amplitude of their synaptic response is very small and is likely to disappear in the noise (Qi et al., 2014, in submission). However, this kind of problem is not restricted to the paired recording approach but will also occur with other techniques used to study synaptic connectivity. In recent year light–induced activation of neuronal microcircuits (i.e., by photo-release of caged glutamate or by activation of channelrhodopsin) has been used to investigate neuronal connectivity, even on a larger scale42-52. However, with these optical approaches it is not possible to identify the structural properties of the presynaptic neuron type. Furthermore, the number and location of synaptic contacts established by a neuronal connection cannot be identified, at least not to date. Paired recordings, on the other hand, allow the characterization of both pre- and postsynaptic neuron types in a synaptic microcircuit. This is particularly important since many studies have shown that both GABAergic interneurons and excitatory neurons are highly diverse with respect to their morphology and synaptic physiology53-56. Thus, the identification of both pre- and postsynaptic neurons is a prerequisite for the description of a synaptic connection57. Finally, paired recordings permit the recording of different configurations of synaptic connection (reciprocal connections, coexisting gap junctions and chemical synapses). Therefore, the paired recording technique will remain an important approach for studying neuronal microcircuits. We would like to thank all members of ‘Function of Neuronal Microcircuits’ Group at Institute of Neuroscience and Medicine, INM-2, Research Centre Jülich and the ‘Function of Cortical Microcircuits’ Group in the Dept. of Psychiatry, Psychotherapy and Psychosomatics, Medical School, JARA, RWTH Aachen University for fruitful discussions. This work was supported by the DFG research group on Barrel Cortex Function (BaCoFun). Hughes, G. M., Tauc, L. A direct synaptic connexion between the left and right giant cells in Aplysia. J Physiol. 197, (3), 511-527 (1968). Korn, H., Triller, A., Mallet, A., Faber, D. S. Fluctuating responses at a central synapse: n of binomial fit predicts number of stained presynaptic boutons. Science. 213, (4510), 898-901 (1981). Miles, R. Synaptic excitation of inhibitory cells by single CA3 hippocampal pyramidal cells of the guinea-pig in vitro. J Physiol. 428, (1), 61-77 (1990). Malinow, R. Transmission between pairs of hippocampal slice neurons: quantal levels, oscillations and LTP. Science. 252, (5006), 722-724 (1991). Mason, A., Nicoll, A., Stratford, K. Synaptic transmission between individual pyramidal neurons of the rat visual cortex in vitro. J Neurosci. 11, (1), 72-84 (1991). Thomson, A. M., West, D. C. Fluctuations in pyramid-pyramid excitatory postsynaptic potentials modified by presynaptic firing pattern and postsynaptic membrane potential using paired intracellular recordings in rat neocortex. Neuroscience. 54, (2), 329-346 (1993). 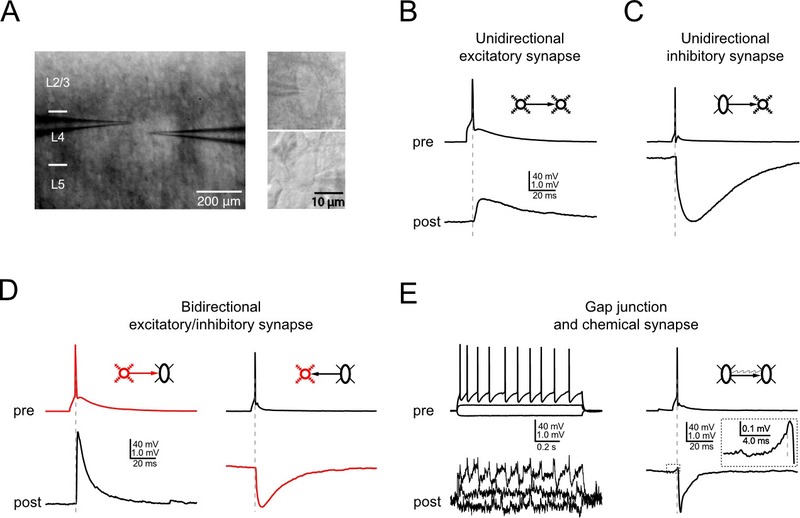 Buhl, E. H., Halasy, K., Somogyi, P. Diverse sources of hippocampal unitary inhibitory postsynaptic potentials and the number of synaptic release sites. Nature. 368, (6474), 823-828 (1994). Bolshakov, V. Y., Siegelbaum, S. A. Regulation of hippocampal transmitter release during development and long-term potentiation. Science. 269, (5231), 1730-1734 (1995). Debanne, D., Guerineau, N. C., Gahwiler, B. H., Thompson, S. M. Physiology and pharmacology of unitary synaptic connections between pairs of cells in areas CA3 and CA1 of rat hippocampal slice cultures. J Neurophysiol. 73, (3), 1282-1294 (1995). Miles, R., Toth, K., Gulyas, A. I., Hajos, N., Freund, T. F. Differences between somatic and dendritic inhibition in the hippocampus. Neuron. 16, (4), 815-823 (1996). MacVicar, B. A. Infrared video microscopy to visualize neurons in the in vitro brain slice preparation. J Neurosci Methods. 12, (2), 133-139 (1984). Dodt, H. U., Zieglgansberger, W. Visualizing unstained neurons in living brain slices by infrared DIC-videomicroscopy. Brain Res. 537, (1-2), 333-336 (1990). Stuart, G. J., Dodt, H. U., Sakmann, B. Patch-clamp recordings from the soma and dendrites of neurons in brain slices using infrared video microscopy. Pflugers Arch. 423, (5-6), 511-518 (1993). Debanne, D., et al. Paired-recordings from synaptically coupled cortical and hippocampal neurons in acute and cultured brain slices. Nat Protoc. 3, (10), 1559-1568 (2008). Gulyas, A. I., et al. Hippocampal pyramidal cells excite inhibitory neurons through a single release site. Nature. 366, (6456), 683-687 (1993). Silver, R. A., Lubke, J., Sakmann, B., Feldmeyer, D. High-probability uniquantal transmission at excitatory synapses in barrel cortex. Science. 302, (5652), 1981-1984 (2003). Biro, A. A., Holderith, N. B., Nusser, Z. Quantal size is independent of the release probability at hippocampal excitatory synapses. J Neurosci. 25, (1), 223-232 (2005). Crochet, S., Chauvette, S., Boucetta, S., Timofeev, I. Modulation of synaptic transmission in neocortex by network activities. Eur J Neurosci. 21, (4), 1030-1044 (2005). Bruno, R. M., Sakmann, B. Cortex is driven by weak but synchronously active thalamocortical synapses. Science. 312, (5780), 1622-1627 (2006). Constantinople, C. M., Bruno, R. M. Deep cortical layers are activated directly by thalamus. Science. 340, (6140), 1591-1594 (2013). Markram, H., Lubke, J., Frotscher, M., Roth, A., Sakmann, B. Physiology and anatomy of synaptic connections between thick tufted pyramidal neurones in the developing rat neocortex. J Physiol. 500, (Pt 2), 409-440 (1997). Gray, E. G. Axo-somatic and axo-dendritic synapses of the cerebral cortex: an electron microscope study). J Anat. 93, (Pt 4), 420-433 (1959). Uchizono, K. Characteristics of excitatory and inhibitory synapses in the central nervous system of the cat). Nature. 207, (997), 642-643 (1965). Tamas, G., Buhl, E. H., Lorincz, A., Somogyi, P. Proximally targeted GABAergic synapses and gap junctions synchronize cortical interneurons. Nat Neurosci. 3, (4), 366-371 (2000). 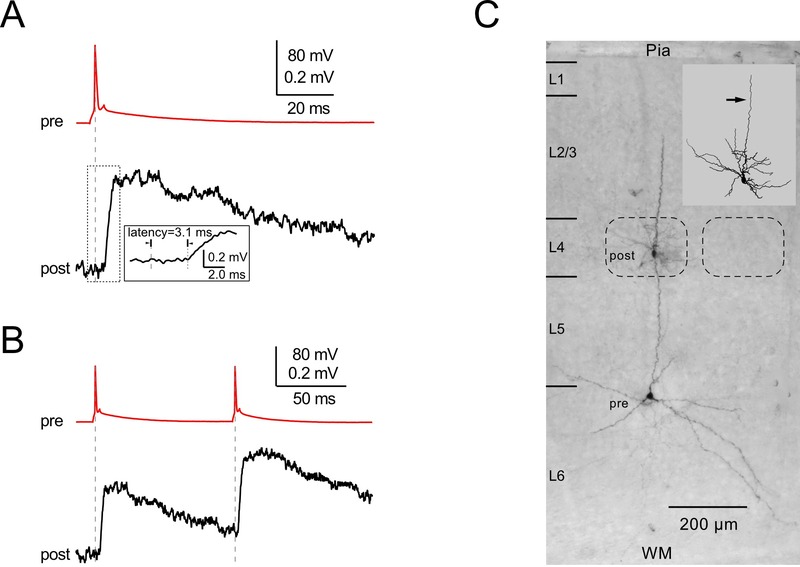 Feldmeyer, D., Lubke, J., Silver, R. A., Sakmann, B. Synaptic connections between layer 4 spiny neurone-layer 2/3 pyramidal cell pairs in juvenile rat barrel cortex: physiology and anatomy of interlaminar signalling within a cortical column. J Physiol. 538, (Pt 3), 803-822 (2002). Feldmeyer, D., Lubke, J., Sakmann, B. Efficacy and connectivity of intracolumnar pairs of layer 2/3 pyramidal cells in the barrel cortex of juvenile rats). J Physiol. 575, (Pt 2), 583-602 (2006). Helmstaedter, M., Staiger, J. F., Sakmann, B., Feldmeyer, D. Efficient recruitment of layer 2/3 interneurons by layer 4 input in single columns of rat somatosensory cortex). J Neurosci. 28, (33), 8273-8284 (2008). Oertner, T. G., Sabatini, B. L., Nimchinsky, E. A., Svoboda, K. Facilitation at single synapses probed with optical quantal analysis. Nat Neurosci. 5, (7), 657-664 (2002). Koester, H. J., Johnston, D. Target cell-dependent normalization of transmitter release at neocortical synapses. Science. 308, (5723), 863-866 (2005). Markram, H., Lubke, J., Frotscher, M., Sakmann, B. Regulation of synaptic efficacy by coincidence of postsynaptic APs and EPSPs. Science. 275, (5297), 213-215 (1997). Egger, V., Feldmeyer, D., Sakmann, B. Coincidence detection and changes of synaptic efficacy in spiny stellate neurons in rat barrel cortex. Nat Neurosci. 2, (12), 1098-1105 (1999). Eggermann, E., Feldmeyer, D. Cholinergic filtering in the recurrent excitatory microcircuit of cortical layer 4. Proc Natl Acad Sci U S A. 106, (28), 11753-11758 (2009). Feldmeyer, D., van Aerde, K. I., Qi, G. Society for Neuroscience. 335.313 (2012). Radnikow, G., Gunter, R. H., Marx, M., Feldmeyer, D. Neuronal Network Analysis : Concepts and Experimental Approaches. Fellin, T., Halassa, M. 67, Springer Verlag. 405-431 (2012). Feldmeyer, D., Egger, V., Lubke, J., Sakmann, B. Reliable synaptic connections between pairs of excitatory layer 4 neurones within a single 'barrel' of developing rat somatosensory cortex. J Physiol. 521, (Pt 1), 169-190 (1999). Koelbl, C., Helmstaedter, M., Lubke, J., Feldmeyer, D. A Barrel-Related Interneuron in Layer 4 of Rat Somatosensory Cortex with a High Intrabarrel Connectivity). Cereb Cortex. (2013). Marx, M., Gunter, R. H., Hucko, W., Radnikow, G., Feldmeyer, D. Improved biocytin labeling and neuronal 3D reconstruction. Nat Protoc. 7, (2), 394-407 (2012). Biro, A. A., Holderith, N. B., Nusser, Z. Release probability-dependent scaling of the postsynaptic responses at single hippocampal GABAergic synapses. J Neurosci. 26, (48), 12487-12496 (2006). Huang, C. H., Bao, J., Sakaba, T. Multivesicular release differentiates the reliability of synaptic transmission between the visual cortex and the somatosensory cortex. J Neurosci. 30, (36), 11994-12004 (2010). Helmstaedter, M., et al. Connectomic reconstruction of the inner plexiform layer in the mouse retina. Nature. 500, (7461), 168-174 (2013). Oberlaender, M., et al. Cell type-specific three-dimensional structure of thalamocortical circuits in a column of rat vibrissal cortex. Cereb Cortex. 22, (10), 2375-2391 (2012). Dantzker, J. L., Callaway, E. M. Laminar sources of synaptic input to cortical inhibitory interneurons and pyramidal neurons. Nat Neurosci. 3, (7), 701-707 (2000). Schubert, D., et al. Layer-specific intracolumnar and transcolumnar functional connectivity of layer V pyramidal cells in rat barrel cortex. J Neurosci. 21, (10), 3580-3592 (2001). Schubert, D., Kotter, R., Zilles, K., Luhmann, H. J., Staiger, J. F. Cell type-specific circuits of cortical layer IV spiny neurons. J Neurosci. 23, (7), 2961-2970 (2003). Schubert, D., Kotter, R., Luhmann, H. J., Staiger, J. F. Morphology, electrophysiology and functional input connectivity of pyramidal neurons characterizes a genuine layer va in the primary somatosensory cortex. Cereb Cortex. 16, (2), 223-236 (2006). Yoshimura, Y., Dantzker, J. L., Callaway, E. M. Excitatory cortical neurons form fine-scale functional networks. Nature. 433, (7028), 868-873 (2005). Yoshimura, Y., Callaway, E. M. Fine-scale specificity of cortical networks depends on inhibitory cell type and connectivity. Nat Neurosci. 8, (11), 1552-1559 (2005). Shepherd, G. M., Svoboda, K. Laminar and columnar organization of ascending excitatory projections to layer 2/3 pyramidal neurons in rat barrel cortex. J Neurosci. 25, (24), 5670-5679 (2005). Bureau, I., von Saint Paul, F., Svoboda, K. Interdigitated paralemniscal and lemniscal pathways in the mouse barrel cortex. PLoS Biol. 4, (12), e382 (2006). Adesnik, H., Scanziani, M. Lateral competition for cortical space by layer-specific horizontal circuits. Nature. 464, (7292), 1155-1160 (2010). Molnar, Z., Cheung, A. F. Towards the classification of subpopulations of layer V pyramidal projection neurons. Neurosci Res. 55, (2), 105-115 (2006). Doyle, J. P., et al. Application of a translational profiling approach for the comparative analysis of CNS cell types. Cell. 135, (4), 749-762 (2008). Brown, S. P., Hestrin, S. Intracortical circuits of pyramidal neurons reflect their long-range axonal targets. Nature. 457, (7233), 1133-1136 (2009). Groh, A., et al. Cell-type specific properties of pyramidal neurons in neocortex underlying a layout that is modifiable depending on the cortical area. Cereb Cortex. 20, (4), 826-836 (2010). Brown, S. P., Hestrin, S. Cell-type identity: a key to unlocking the function of neocortical circuits. Curr Opin Neurobiol. 19, (4), 415-421 (2009).